The Type 091 (Chinese designation: 09-I; NATO reporting name: Han class) is a first generation nuclear attack submarine produced by the People's Republic of China. They were the first nuclear-powered submarine employed by the People's Liberation Army Navy Submarine Force, and the first indigenously produced nuclear attack submarines in Asia. The Chinese naval nuclear power program started in July 1958 when Mao Zedong and the Central Military Commission gave approval to start the 091 submarine project. Peng Shilu (彭士禄) was the first chief designer of this project. 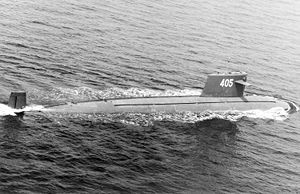 The first submarine in the class, the Long March I, was commissioned in 1974; the last was launched in 1990. In 1983, Peng shifted from military to civilian sector in application of nuclear power plants and his duty at the nuclear submarine project was succeeded by Huang Xuhua. The Type 091 has operated mainly in local waters, and has appeared in incidents. One submarine shadowed a U.S. carrier battle group in the mid-1990s. Another entered Japanese territorial waters through the Ishigaki, Okinawa island group near Taiwan in November 2004, causing Japan's maritime forces to go on alert for the second time since the Second World War; China apologized for the trespass and blamed "technical reasons" on the submarine. The boats have received major upgrades and numerous refits since commissioning. They have six 533 mm (21 in) torpedo tubes and carry 20 torpedoes. Alternatively, they can carry 36 mines in their tubes. It is capable of firing sub-launched variants of the C-801 anti-ship missile as well as a range of indigenous and Russian torpedoes or mines. All remaining hulls have been refitted with new sonars, with Type H/SQ2-262B sonar manufactured by No. 613 Factory replacing the original Type 603 sonar on board. Anechoic tiles were added later to reduce noise levels. The Type 091 is extremely noisy and has poor radiation shielding, a result of being based on 1950s technology. It cannot launch missiles while submerged. Overall, the submarine's tactical utility is limited against modern combatants. In 1989, Pakistan made an abortive attempt to procure a Type 091 for USD$63 million in 1992:contents, as a response to the Soviet K-43 leased to India in 1988.:92 Occasional rumours of Pakistani interest in a Type 091 continued to surface as late as 2012; any purchase would be useful mainly as an antiquated training platform. 401 1970 1974 2013 Reactor removed. Preserved at the Chinese Navy Museum, Qingdao. ^ a b Purser, Benjamin S., III; Chanse, Michael S. (3 August 2012). "Waypoint or Destination? The Jin-Class Submarine and China's Quest for Sea-Based Nuclear Deterrence". China Brief. Jamestown Foundation. 12 (15). Retrieved 27 October 2018. ^ "The achievements of CNNC during the year 2017". www.china5e.com (in Chinese). 中国能源网. ^ a b Li, Zhongxiao (2018-12-06). "There is no "father" of China's nuclear submarines, and even if there is, it should not be Huang Xuhua". Sina News (in Chinese). Beijing, China: Sina Corp.
^ Sullivan, Lawrence R.; Liu, Nancy Y. (2015). Historical Dictionary of Science and Technology in Modern China. Rowman & Littlefield Publishers. pp. 322–3. ISBN 978-0-8108-7855-6. ^ "China Apologizes for Submarine Incursion". Archived from the original on 2006-10-23. ^ United States Joint Economic Committee (2016). China's Economic Dilemmas in the 1990s: The Problem of Reforms, Modernisation and Interdependence. Routledge. ISBN 9781315485430. Retrieved 24 September 2018. ^ Dittmer, Lowell (2015). South Asia's Nuclear Security Dilemma: India, Pakistan, and China: India, Pakistan, and China. Routledge. ISBN 9781317459569. Retrieved 24 September 2018. ^ "China decommissions 1st nuclear submarine". Xinhua. 2013-10-29. Retrieved 2013-10-29. ^ Zhao, Lei (27 October 2016). "Nuke submarine to go on display". China Daily. Retrieved 31 December 2018. Erickson, Andrew S.; Goldstein, Lyle J. (Winter 2007). "China's future nuclear submarine force: Insights from Chinese Writings". Naval War College Review. United States Naval War College. 60 (1): 55–79. Retrieved 27 October 2018. Rehman, Iskander (Autumn 2012). "Drowning Stability: The Perils of Naval Nuclearization and Brinkmanship in the Indian Ocean". Naval War College Review. United States Naval War College. 65 (4): 64–88. Retrieved 27 October 2018. This page was last edited on 15 January 2019, at 04:03 (UTC).